Episode 238: Summer of Spouses, Margerie Bonner Lowry | Book Fight! We’re still in our Summer of Spouses season, in which we’re exploring the lesser-known spouses of famous writers. This week’s marriage is a particularly interesting one, and a particularly sad one. 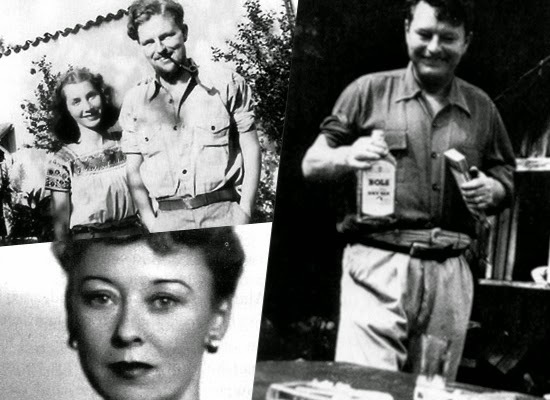 Margerie Bonner married Malcolm Lowry when both were in their thirties–she’d been an actress and a personal assistant, while he’d been working on the novel that would eventually be regarded as one of the twentieth century’s best. Without her help, it seems unlikely he ever would have finished it (or, at the very least, it wouldn’t have been as coherent). After Under the Volcano was published, Lowry became an even more spectacular drunk than he was while writing the book, and his life sort of spiraled out of control. Then, it’s possible his wife killed him. In addition to our discussion of the Lowrys and their marriage, we also eat some snacks (and drink some coffee) sent to us by a listener. We also dive into the internet’s top forum for good advice on marriage and divorce, Yahoo Answers! Categories: Episodes, Summer of Spouses | Tags: Barrelhouse magazine, book podcast, did Malcolm Lowry's wife kill him?, malcolm lowry spectacular drunk, margerie bonner and malcolm lowry, margerie bonner is her own person, podcasts about contemporary literature, writer couples, writer marriages | Permalink.